In case you live somewhere that has no access to mass market goods, but has Internet, since you're reading this post, I present the latest in mass market hype for the upcoming Star Wars movie. Yoda and Darth Vader grace the cover of boxes of what amounts to Lucky Charms, just redone with Star Wars marshmallows. Larry had a Yoda box. The movie comes out in December. In February, there will be two more limited edition boxes released, according to the General Mills web site. My beloved Cheerios has limited edition posters contained in the boxes. I haven't seen this on my store shelf, but I haven't been looking. In cleaning the basement, I stumbled upon the Star Wars calendar I got in 1978. Back then, calendars involving movies were rare. Star Wars ushered in the merchandising phenomenon we take for granted today. I gave the calendar to Larry. 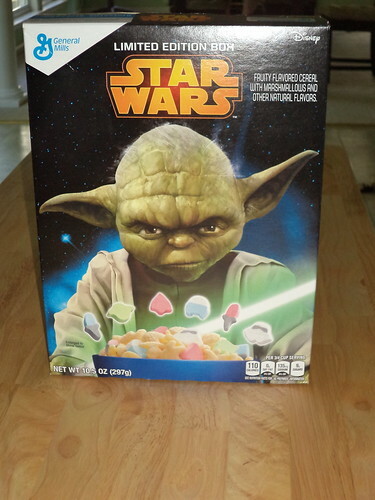 In the grand scheme of eBay merchandise, it's probably worth more than an unopened box of Yoda cereal will be. I've always felt that the "goodness" of a movie is in direct proportion to how much pre-release hype it gets. There is a current movie, "Pixels", which looked good in the one trailer I saw, but which has been critically panned. There's not been much hype. Maybe the studio realized it was a stinker and so they released it just to get it off their shelves. It flies in the face of my theory. With all this pre-release merchandising, I'm worried about the Star Wars movie. I want it to be good, but if there's cereal already out, are they trying to make back the cost of the movie by shilling foodstuffs? Is than an omen? I didn't try this. I'm not a Lucky Charms fan. In the grand scheme of making money, product merchandising is where it's at. We aren't at full capacity yet, either, on the Star Wars hype. By the time December rolls around, I may be so tired of Yoda's face everywhere that I won't want to go see the movie.